Relatives: Son of Dr Henry Newman and Mrs A. S. Newman. James Herbert Newman was born in Hadleigh in 1871. He was the son of the local doctor, Henry Newman and his wife Anne Susan nee Travis. He was educated at boarding schools at Great Yarmouth and at Epsom College. He seems to have inherited the title of the ‘Lord of the Manor’ of Somersham from his uncle, the Rev James Travis. Military gravestones on the Western Front can give the observer clues about the soldier buried there. The inscription on the upper part of the stone gives the soldiers military details, while the inscription at the foot are words chosen by the soldiers next of kin. These words are usually very personal, but seldom refer to the community from where the soldier originates. 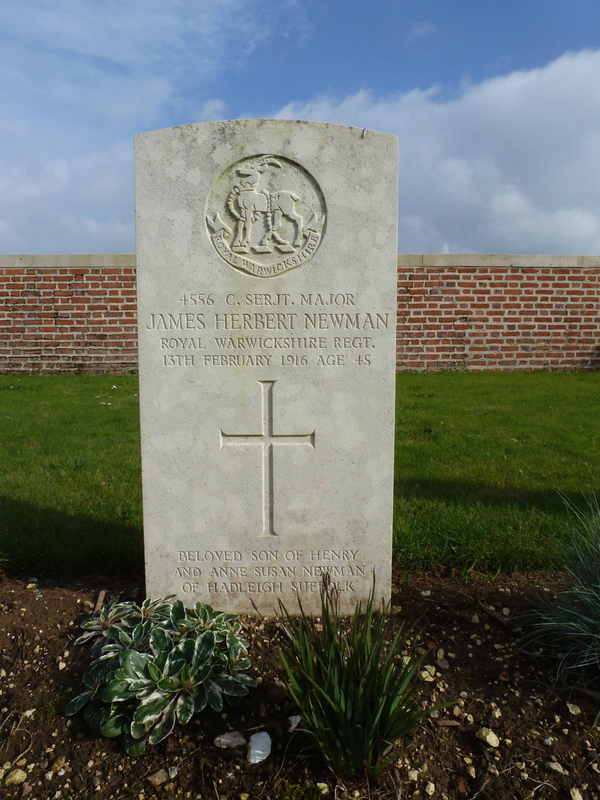 One exception is that of Company Sergeant Major (CSM) James Herbert Newman whose gravestone on the Somme battlefield clearly states that he comes from “Hadleigh Suffolk”. So was there a reason why James' family included the words 'OF HADLEIGH SUFFOLK' on the headstone? We think there was. 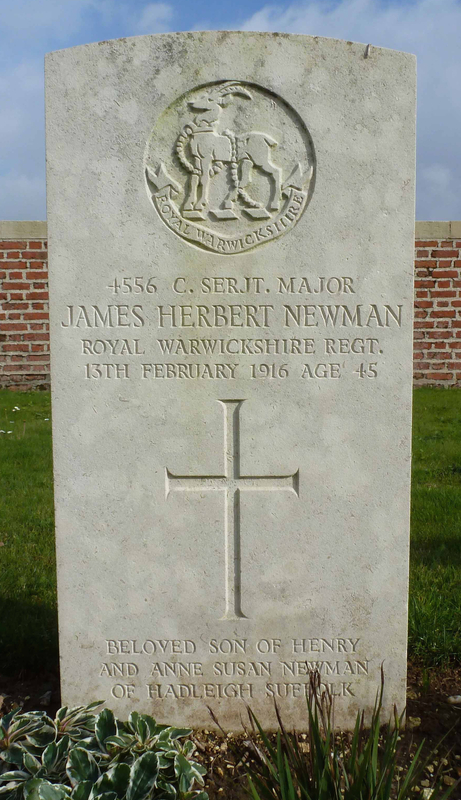 James Herbert Newman, had an extensive and varied military career. In 1892 he joined the Medical Staff Corps (MSC) but bought himself out after just one year. In June 1895 he joined the Royal Warwickshire Regiment under the alias of Harold Newnham born Dunedin, New Zealand; perhaps the alias was to hide his earlier exit from the MSC. He served with the 1st Battalion in 1898 when they fought at Atbara during Lord Kitchener's reconquest of the Sudan and was awarded the Queen’s Sudan Medal and the Khedive’s Sudan Medal. It appears that he was sent home from the Sudan through illness, most likely with dysentery and enteric fever contracted through unhealthy water supplies. As a lance corporal in the 2nd Battalion he saw service in the Second Boer War receiving the Queen’s South Africa medal with three clasps; Cape Colony, Orange Free State and Transvaal. He went to Bermuda in 1901 to guard Boer prisoners of war. In 1905 he formally removed his alias, although his place of birth continued to be recorded as New Zealand. 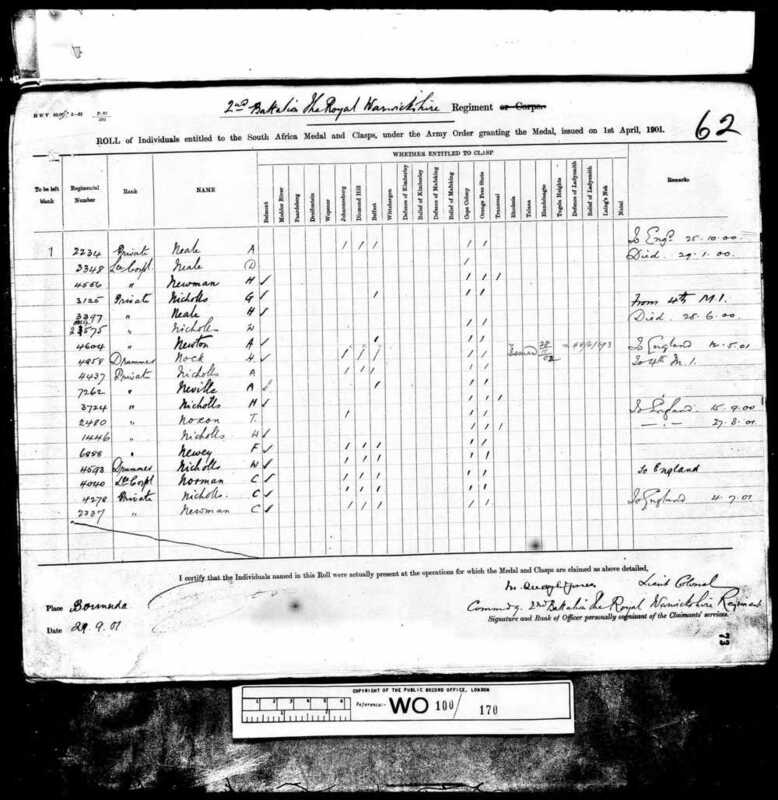 In the 1911 census he was a sergeant with the regiment at Budbrooke Barracks, Warwickshire and also that year he may have been involved when the Regiment was called to suppress riots in Liverpool. At the outbreak of the Great War in 1914 he was with the 4th (Special Reserve) Battalion at Portsmouth, later moving to Parkhurst on the Isle of Wight; given his experience he was most likely in a training role. At the Battle of Loos in September 1915 the Warwicks suffered extremely heavy casualties including two company sergeant majors killed. 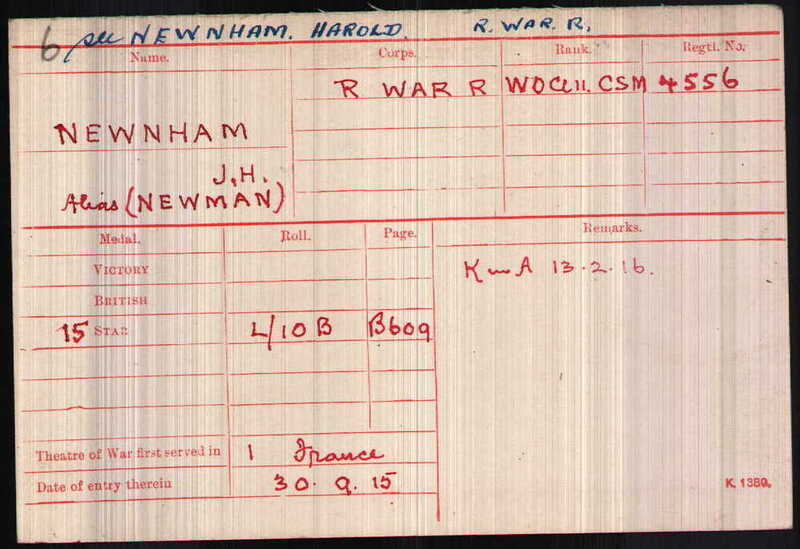 As a result Company Sergeant Major James Herbert Newman was sent out to France as a replacement. At the end of November the 2nd Warwicks left the area of the Loos battlefield and spent most of December and January in billets resting clear of danger to the west of Amiens. In early February they moved to billets and trenches close to the frontline on a shallow hillside to the south east of the town of Albert, an area that was to see heavy fighting during the Battle of the Somme the following summer. It was here on a wet cold day, the 13th February 1916, that James Herbert Newman was killed. He was 45 and had given military service spanning 24 years. 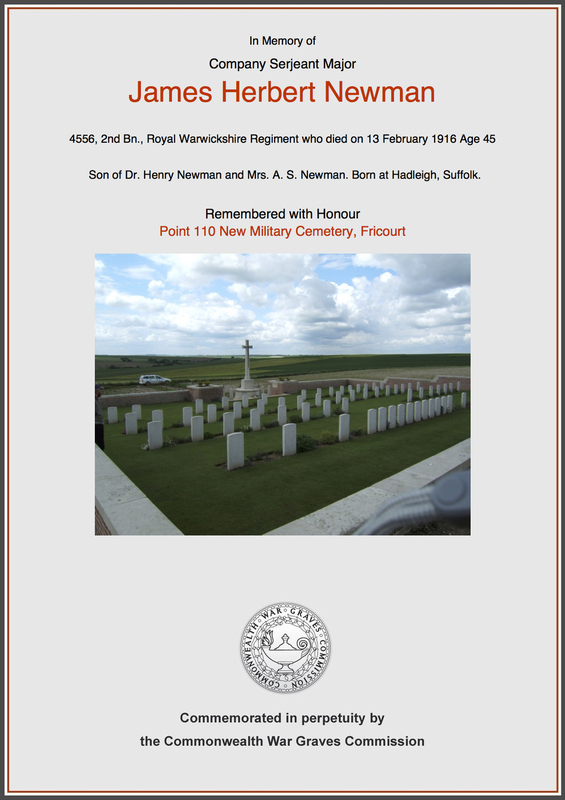 Today he lies in Point 110 New Military Cemetery, a small resting place amid fields of sugar beet and potatoes. He is remembered on memorials at Epsom College, Hadleigh and also at Pamber Heath on the outskirts of Basingstoke where his widowed mother had moved. After his death his mother probably became aware of the incorrect place of birth on his service records and in an attempt to set the record straight, had his true place of birth inscribed on his gravestone. The whereabouts of James' medals are not known, however, he was entitled to the above three medals for his service during the Great War. 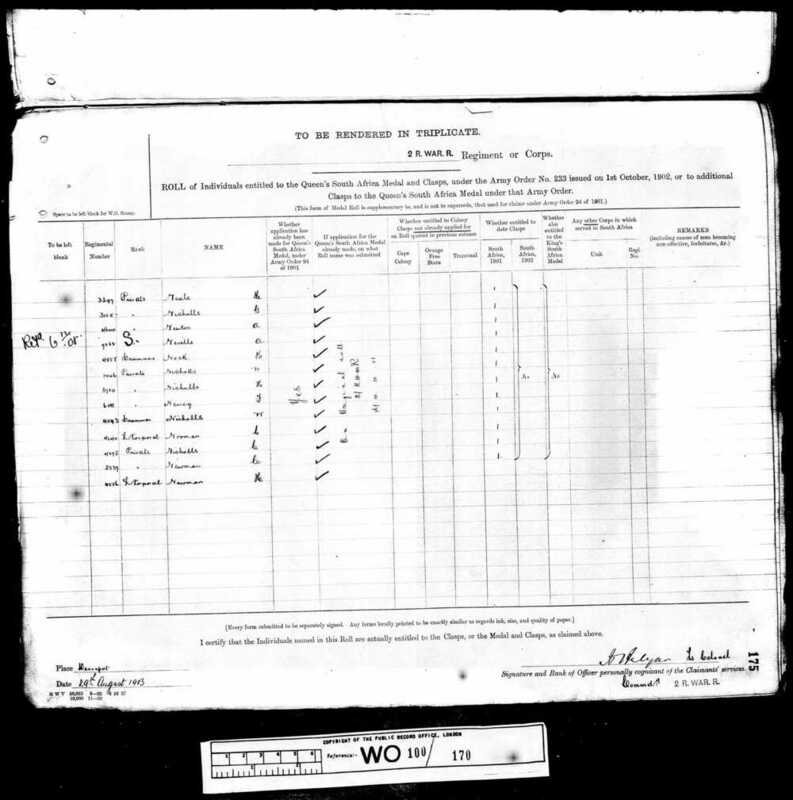 During our research into James' family, we discovered that his grandfather was also in the army. He was a Lieutenant in the 4th Irish Dragoon Guards and fought in the Peninsula campaign of the Napoleonic Wars. So a man who fought and died in the Great War had a grandfather who was with Wellington in Spain from 1811 to 1813. An interesting footnote. 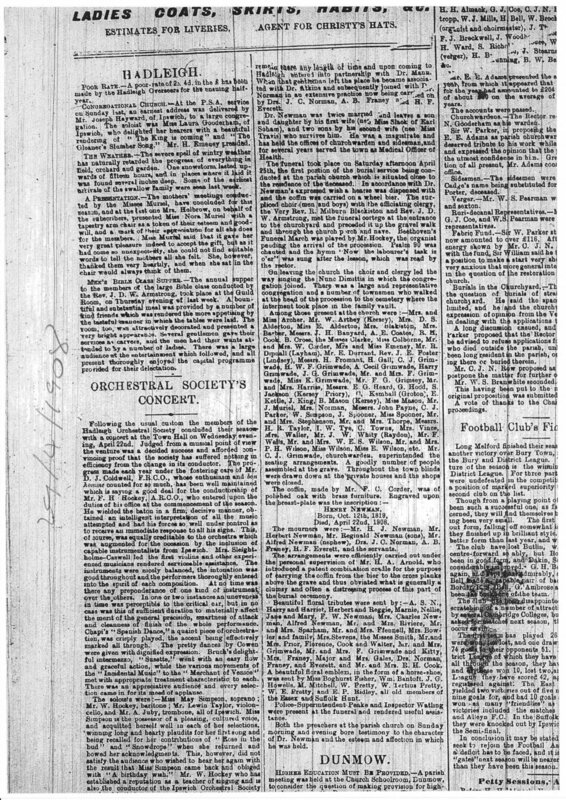 We hope that this page has been able to tell the story of James Herbert Newman. If you know of any information which might help to add to the story then please get in touch.